WRITTEN BY NATH FAUVEAU, MEDAIR PRESS OFFICER. UPDATES BY MICHAEL PRINS, FH CANADA. JEAN-PIERRE STANDS NEAR THE REMAINS OF HIS TOWN. PHOTO COMPLIMENTS OF MEDAIR PRESS. 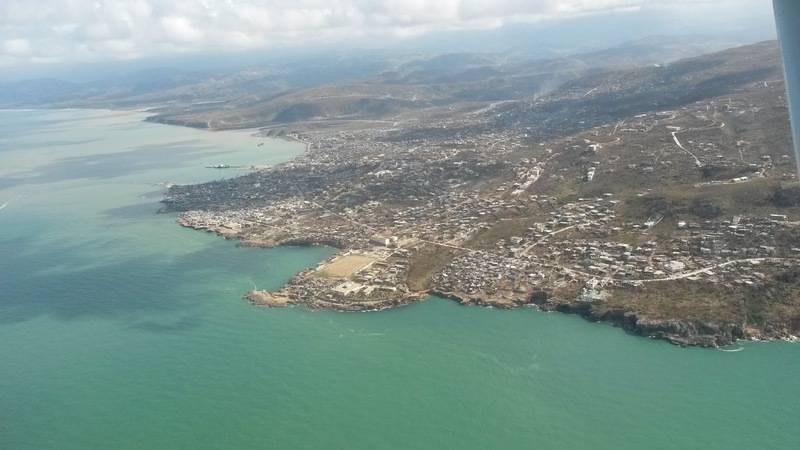 A special thank you to Nath Fauveau (MEDAIR, an FH partner) and Jean-Pierre (Haitian resident) for sharing this personal account in a time of great need and sorrow for Haiti. Currently 1.4 million people (12.9% of population) need humanitarian assistance - this includes over 590,000 children. Approximately 112,500 children under age five are at risk of acute malnutrition. Cholera is starting to be reported. Businesses and crops have been decimated and thousands of children have had their education disrupted. Nath Fauveau met Jean-Pierre in the midst of rebuilding his life. “Everyone here has lost everything, except for the clothes on their backs. People are now sleeping in churches and schools on pieces of cardboard or sheets.” This is one of the first things Jean-Pierre tells me when we meet in Les Coteaux while a Medair team conducts a joint WASH (water, sanitation, and hygiene) and Shelter assessment with partners from Medical Teams International and World Concern. After this conversation, I realised that the schools and churches were also partially or entirely destroyed, which means people have been sleeping in unsafe areas and are not protected from the elements. Jean-Pierre’s French is limited and my Creole is non-existent, but somehow we manage to communicate. In his town, he knows of “only” about five people who died. Jean-Pierre’s neighbourhood, which spreads along the shore, used to have a road through it that was the life of the town that offered access to most of the town’s activities. Now there is no longer any indication that there ever was a road. Debris covers the entire town. Looking around, I don’t see a water source but I do see people using water for food preparation, washing clothes, etc. I ask Jean-Pierre where they are getting the water from: “The water tank we used to go to dried up before the storm, so lately we have been using a tank a bit farther out [about a 10 mn walk]. But the hurricane damaged it, so we can no longer collect water there.” This limits their supply of water to two sources: the open ocean and the streams. Neither of those water sources are safe. I saw with my own eyes an older woman collect water from the gutter, and all I could do then was pray and hope she would at least boil it. “People are starting to complain about stomach pain and diarrhoea,” Jean-Pierre tells me. He doesn’t think cholera has reached his town yet, but I checked the official reports and there is a minimum of six confirmed cases here. If something isn’t done very soon, it will be a full-blown outbreak. One of Jean-Pierre’s neighbours, Pierre Cameau, had two houses made of brick, wood, and corrugated tin. Both of them completely collapsed. His next-door neighbour’s house is a concrete house and most of it resisted the hurricane. But only people with money can afford to build such a house. Thankfully, the neighbour has let Pierre Cameau, his wife, and their six children take shelter in his house. “I will never have money to rebuild my two houses, but I will start with one, I have no other choice. If your organisation can help us rebuild, we need concrete, tools, sand…,” said Pierre. Shelters, cholera prevention, safe water, food, clothes, hygiene items… The needs are so widespread and so many people are pleaing for help, it’s difficult not to feel discouraged. But the resilience of the Haitian people, who have begun to pick up where each catastrophe left them, is amazing. Food for the Hungry was on-the-ground doing assessments and mobilizing their staff and volunteer teams hours after Hurricane Matthew passed. 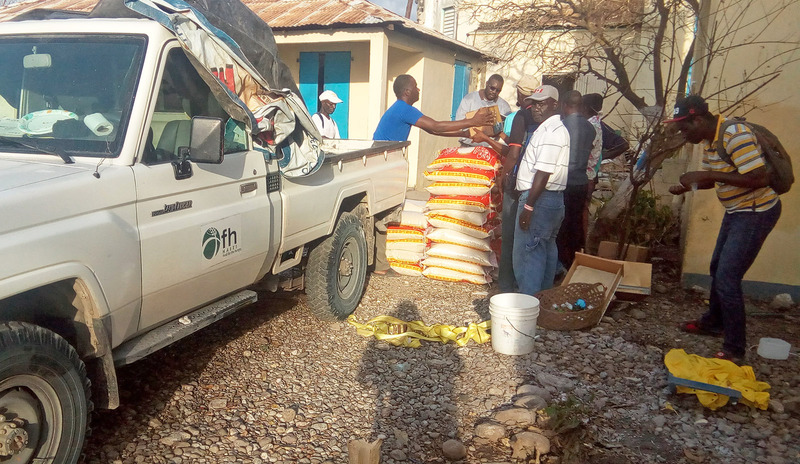 Over the past two weeks, FH has collaborated with other relief aid partners through Integral Alliance to distribute desperately needed food, aqua tabs, filters, and more. Most of this aid was directed to families and communities in the southern peninsula that were hit the hardest. Communities that FH is currently in a long-term development partnership fared better than most. Yet, there are immediate needs that must be addressed before development work can continue. FH staff will focus renewed attention here; because they were not hit as hard, there will likely be less government and other international aid coming to these regions. FH is committed to continuing its walk with these families as they too rebuild. Ongoing efforts include continued water potability testing, distribution of water filters and blankets, and provision of tools and materials to rebuild latrines and homes. FH is organizing teams of local Haitians to help repair over a dozen schools, which could serve as shelters before being reopened to students. Food for the Hungry has completed multi-sector assessments in collaboration with its Integral Alliance partners Medair, World Concern, and Medical Teams International. Recovery will be long and hard, especially in the southern peninsula. Water filtration units have been distributed in several communities, but many areas are still without safe water. Food supplies is proving to be an ongoing problem and local populations will depend on relief aid for some time yet. Cholera treatment centres are functioning, hoping to prevent an outbreak. Community-led clean up has begun. In some areas, up to 90% of homes were flattened. Families are rebuilding, but in their desperation, building techniques are poor. FH staff continue to help train local work crews. The situation is tough. Haiti was still recovering from the earthquake in 2010, and as one of the poorest countries in the western hemisphere, suffers political tensions, health problems, massive unemployment, weak infrastructure, and more. As international media moves on to other topics, keep Haiti in your prayers. A GROUP OF MOTHERS EACH RECIEVE A WATER FILTER.